Hans Meevis' (not always) Jewelry Blog: Further Plique a Jour experiments. Further Plique a Jour experiments. Ok, from my previous post I received a number of replies commiserating me for the failure of my titanium experiment. Failure is to me only another way that points forward. As in, try another way. One always learns something from failure , so it is never wasted. The copper backed method is also not a new way to plique a jour. It is known by it’s Japanese name of shotai-jippo. Anyway, here is the Wiki link that explains how clueless we actually are today. So, because I had purposely overheated the piece all the enamel was ruined. It fell out. So I used the exact titanium piece for another experiment. I figured that the enamel was not ‘wetting’ the titanium, so I copper plated the test piece. Metallic copper does not bond well to glass but its oxide, Cu2O, is wetted by molten glass and partially dissolves in it, forming a strong bond. And the oxide also bonds well to the underlying metal. The glass-oxide bond is stronger than glass-metal. And for good measure I made a titanium ring and a large silver test piece as well. The titanium ring I didn’t copper plate just as a second test to see if titanium really didn’t like enamel. And the silver washer just to see how big can I make plique a Jour. This one measures 40mm inside diameter. Packing. I always use distilled water to wet my enamels. After the second firing, it looks rough, but not really. So, instead of pealing the copper off the back, I rather etched it off. Because this is purely experimental I didn't bother to check is the etching solution would actually attack the enamels. In this case the pink went south. I have some painful experience with this. Many, many years ago, in the early 1980’s I was about two years into the jewellery trade and I made this 18ct plique a ' jour butterfly. 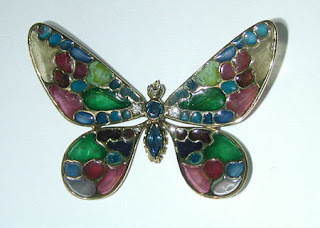 I had never enameled anything before and taking small steps was not in my vocabulary. Curved and domed, 18ct, with a mix of colours that only the young can envisage, it nevertheless took me 120 hours of work to finish. I didn’t use copper as a backing, but a foil of aluminum bronze, which does not allow the enamel to stick to it. Problem was there was no internet so all I had was some books on enameling in general, and in there they said that to remove the metal oxidization, “ just pop it into sulphuric acid” and no harm will come to enamel. Ha, the acid ruined the enamel so badly I had to break out half of it and start again. But once something like that happens, it never comes right and I have had it in my safe for thirty years. To ugly to sell and to pretty to destroy. 4 parts ferric chloride plus 1 part citric acid solution give you the Edinburgh etch. At 40mm diameter, I seem to have reached the limit with torch firing. I know it is too big. But this is just experimenting to push the limits. I’m sure if I annealed it in my vacuum oven for a couple of hours, I would be ok. Those experiments I am busy with as we speak. This was the titanium ring. The expansion co efficients are radically different between titanium and glass. I expect different titanium alloys and different suppliers of enamel might give success , but I am only testing. I don’t have at this time any intent to make something plique-a-jour with titanium. So I plated the titanium ring and then put the old enamel back, added some more around the outer border and fired it again. Didn’t work. The whole thing popped out. I also made a silver control, same size as the titanium washer. Just to make sure . This allowed me to take a photograph, showing for the first time in the history of enameling, precisely how all the little elves and gnomes that live in all the Faberge eggs around the world see the outside world. So next time you are in some fancy Russian or Italian museum specking the plique-a-jour out, just remember, there is a little person behind that glass, specking you right back. Jewelry Making Class List - my comprehensive jewelry tutorial list with plenty of free jewelry making lessons. Good practice with binding wire. This collet makes a great pendant or can be used on a ring. Showing how difficult bezels are made. This ring sparkles like nobody's business. A great ring that leans towards the celtic knot crowd. Beautiful cabochons are set off brilliantly in this ring. One of the most important skills needed in goldsmithing. Seriously cool ring that reflects the center stone right back at you. A great ring to make for your wife and side chick for Xmas. Make this ring and give it to her for a YES answer. This tutorial will teach you in precise detail and easy to follow steps. The best tutorial on exactly how to do torch and oven fired plique-a-jour on the web. 100 pictures and 54 pages show everything you need to know. The most comprehensive gem carving tutorial on the web. 60 pictures and 36 pages of thoroughly explained techniques. Make this dainty eternity ring, a design that never is out of fashion. Complete instructions on how to make the cool looking pendant. Click on the picture. How to make this cute Twist Wire Ring, including setting method. Click on the picture. Sizing rings all the do's and don'ts--especially the do not do this and how to climb out of the hole. This tutoriol tells you how to make the collets, the earrings, the steel jigs and plenty inbetween. 52 pictures and 27 pages of instruction. Detailed instructions on how to make a decorative six claw collet. Essential metalsmithing knowledge. 30 pictures and 17 pages. The second part if this tutorialThis tutorial shows how to turn the first part into a classy dress ring.The first part has to be completed before the second part. How to make this stylish modern dress ring tutorial. Here is a great coin pendant tutorial, suitable for any size coin. A clasp that can't come loose when it is worn. Attaching a bail without soldering easily. How to make old school collets. Instructions you can't find anywhere on the internet. This is actually two rings, and a technical challenge to make. A ring that gives big expanse to a small stone. Classic ring that is given to a young girl. Classic unisex square stone ring. There is only one place on the net where you can find out how to make this ring, and that is here. Making this ring is a challenge that is well worth the end product. Old style eternity ring with modern instructions. This is a long tutorial and very comprehensive. The lesson is done in silver. Complete tutorilal, including stone setting. Click on the picture to see how it was made. All the steps needed to make this ring. Click on the picture to go to the tutorial page. Complete instructions on how to make this pendant. Click on the picture. Step by step instructions on how to make this ring, including the setting method. Click on the picture. All the instructions to make this pretty pearl ring, with gemstone variations. Click on the picture. This one is modern and stylish. Complete instructions take you through A-Z. Tutorial on how to make a traditional signet ring. Reviving a lost art, the handmade hinge. Essential metalsmithing knowledge. A great tutoril on how to make miniature flower earrings. Essentential metalsmithing knowledge when you do custom work. 16 picture and 8 pages makes this tutorial very thorough.